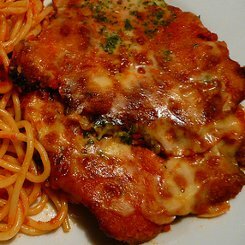 This is a real treat, it’s a variation of Chicken parmigiana that is rustic and very morish. I never mess with it too much and serve it with either a green salad or a pasta on the side that has also been tossed in a little marinara sauce. 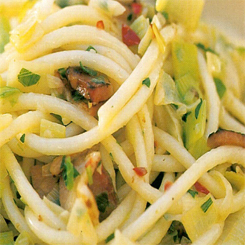 It takes a little longer than some of the other Italian recipes but is worth every second. Heat your oven to 180 Celsius and have a non stick oven tray ready. Take your chicken breasts and slice them so that you can open them and flatten them out like a Chicken Schnitzel. Give them a light pounding with a rolling pin or wine bottle to flatten a bit. Have your beaten egg in a bowl and your bread crumbs on a plate. I recommend the corn flake bread crumbs from Kellogs. Dip your flattened chicken breast into the egg(or milk), shake off the excess and then into the bread crumbs to coat well. Place onto the oven tray and place into the oven for 20 minutes. Once they are done, get a baking dish, pour a 1 cm deep layer of Marinara sauce into the bottom of the dish, place the cooked chicken on top and then cover with more of the Marinara sauce. Sprinkle the Mozzarella over the top and then the Parmesan. pop it back into the oven for another 15 minutes or so until the cheese has melted. It’s rich, and seriously delicious. You should always have Marinara sauce in the freezer, but if you don’t and you want a quick alternative, take a tin of chopped tomatoes and onion with basil in it, heat it up and use a potato masher to mash it up a bit. Cook your pasta in a large pot of salted boiling water. In a pan over a medium to hot heat add a good splash of olive oil or about 2 tablespoons. Add the onions and saute for about 3 minutes until they are starting to go transparent. Now add the garlic and paprika, stir and saute for another 1 minute being careful not to brown the garlic. Add the prawns and toss them around for 2 minutes to cook a little, then add the butter and wine, cook until the butter has melted, add the parsley, season with salt and pepper and allow to simmer for another 2 minutes or so until the prawns have turned a nice pink and are cooked through. The sauce should thicken a little and become glossy. Drain you pasta, place in a large serving bowl with the shrimp sauce poured over the top. 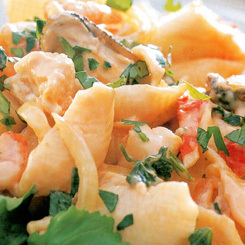 Serve this incredibly delicious prawn pasta with a simple green salad and crusty bread. The recipe is a bit difficult to simply double up but if you are having a 6 people or so I would suggest you make the sauce in two separate pans, it just seems to work out better. Place your pasta in a large pot of salted water and cook to al-dente. The bigger the pot the better. 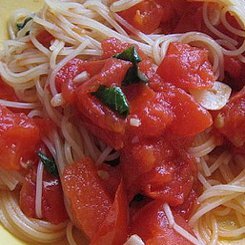 Chop up the basil quite finely and add to the tomatoes, then slice the garlic as finely as you can and add to the tomatoes. Lastly add the Olive oil, mix it together and let it stand while your pasta finishes cooking. Drain the pasta and return to the pot with the tomato mixture, place back on the stove and mix it for about 3 minutes or so to heat the sauce. Add a little salt and pepper to your taste and you are done. It’s a delicious pasta recipe. Serve with warm crusty bread. ½ cup parmesan cheese finely grated. Cook your pasta in a large pot of salted boiling water to al dente, drain leaving a little water in the pot and then return to the pot. While that is going on, cook your bacon in a large pan until well cooked and crisped on the edges. Remove and drain on kitchen paper. Melt the butter in the same pan, add the leeks and cook until tender for about 3 or 4 minutes. Add the chilis and garlic and cook for another 2 minutes or so stirring. Now add the pasta and spring onions to the leek mixture, toss to combine all of the flavors and serve. Done, what could be easier! If you like your pastas a little spicy, leave all or some of the seeds in the chili. 1 medium onion finely chopped or grated. While the pasta cooks put a pan on a medium heat with the oil, add the onions and cook until soft, add the garlic and cook for a further 1 minute. Add the patty pans, carrots, peas and red peppers, cook until the patty pans are softened on the outside but still firm, stir or toss frequently until the peas are hot but still crunchy (about 3 minutes). Add the pasta to the pan along with the mustard and the cream. 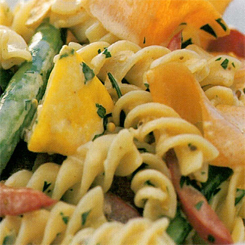 Toss with salad servers or similar to combine all the flavors and allow the cream to heat. That is that, you have a really fantastic flavor. Adding the mint or perhaps a little chili is a very good idea, be adventurous with your tastebuds, you will love it. Cook your pasta in a large pot of fast boiling water to al dente, drain. While that’s on the go cook your bacon and set aside. In a new pot on a medium heat, melt the butter and gently cook the onions and green pepper until they are soft. Don’t let the butter brown. Now add the bacon, mustard, paprika and stir for about 2 minutes, then toss in the flour and stir constantly until you see the mixture bubble and thicken. Combine the milk and the soup in a bowl and pour into the pot gradually, stirring all the time. Keep stirring until you have a gleaming and reasonably thick sauce going. Now for the fun part. Add most of the cheese (about 2/3) and all of the cooked pasta to the sauce mixture. Stir to combine well and then remove from the stove. Now pour the whole lot into an oven dish, sprinkle over the last of the cheese and perhaps a few slices of fresh tomato and some extra bacon bits, place under the grill in your oven to brown the top and you are done. It’s fabulous and will become one of your favorites. 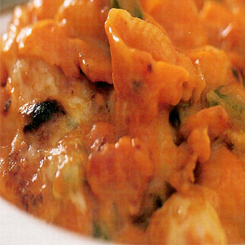 Here is a more traditional macaroni and cheese recipe. In a pan on a medium heat with the olive oil, cook the onion and garlic until soft, now add the marinara mix and stir slowly and gently to cook the seafood. Cooking the seafood should not take more than 5 or 6 minutes. Once cooked, place in a bowl and then into the fridge to cool. While the seafood is cooling cook the pasta in plenty of salted water and then drain u8nder cold water. Add the pasta to a large bowl, mix all of the dressing ingredients together and then add to the pasta along with the cooled seafood and toss gently to coat all of the seafood with the sauce. Serve nice mounds on a bed of rocket. You can use any leaves to bed it down with, iceberg lettuce shredded is really good and of course some ripe slices of avocado on the side are a real winner. 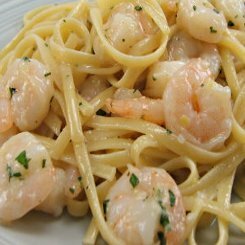 For those who like seafood pasta sauces, here is a shrimp pasta sauce. 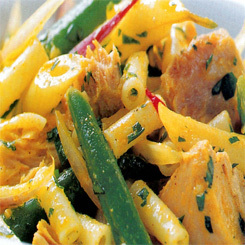 This tuna pasta salad has a little curry powder in it to give it a beautiful yellow colour and a taste quite unlike anything I expected. It was very morish, fresh, crisp and a definite winner for the last of the summer days. 1 tin tuna in oil (415g) drained and flaked. Cook you pasta in plenty of salted water, drain under cold water and set aside. Boil the beans for about 2 minutes until tender but still firm. Now add all of the ingredients to a large bowl and toss well until the yellow of the curry powder coats everything. That is that… no fuss and very tasty. You may like the tuna pasta bake if this one appeals to you. 1 pack curly lasagna sheets (375g) split along the center. Place the breadcrumbs on a plate and heat 1/2 the olive oil in a pan on a medium to high heat. Halve each chicken liver and coat in breadcrumbs. Fry in batches until browned on the outside and still a little springy to the touch. Set them aside. Wipe the pan clean and heat the rest of the oil, cook the onion until soft, add the tomatoes and cook for about 5 minutes or so, stirring until the skin starts coming away from the tomatoes. Now add the stock, rosemary, wine and balsamic vinegar, Stir slowly and constantly allowing the sauce to thicken slightly. Add the chicken liver to the pan, stir and turn off the heat. Gently turn the sauce for about 3 minutes. Cook you pasta to al dente while this is going on, drain, leaving a little water in the pot, sprinkle over a little olive oil and toss to keep from sticking. 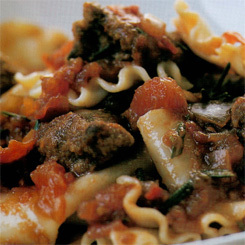 For those not mad for chicken livers, here is a great vegetarian lasagna recipe. Heat your oven to 220 Celsius. Halve, clean and peel the butternut, then slice it into pieces about 5mm thick. Lightly oil a baking tray, place the butternut on the tray and drizzle over a little more olive oil. Bake for about 25 minutes, turning after 15 minutes. Remove and allow to cool for 5 minutes. While the butternut is cooking, cook your pasta in the largest pot you have with plenty of salted water. Drain, leaving a small amount of water in the pot so that it does not go sticky. Whisk the dressing ingredients together very well in a small bowl. 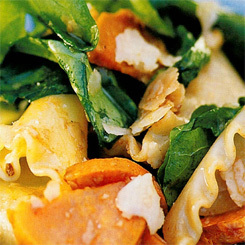 Rip up the rocket and add to a bowl, add the butternut, pasta, parmesan and all of the dressing. Toss well and serve straight away. This recipe is up there with the seared salmon and mango salsa, as one of my summer favorites.